Jonathan's initial sketches. Originally they showed a more forceful aspect of the players. This was later changed to highlight their energetic fighting spirit. Jonathan's initial sketch for the IT themed 'day at work' wall art. Staying top of the game is no mean feat. When you’re a leading ice hockey team, it requires technical skills, energy and the ability to work together as one. Qualities shared by Jonathan Calugi’s whirling order of interconnected lines. 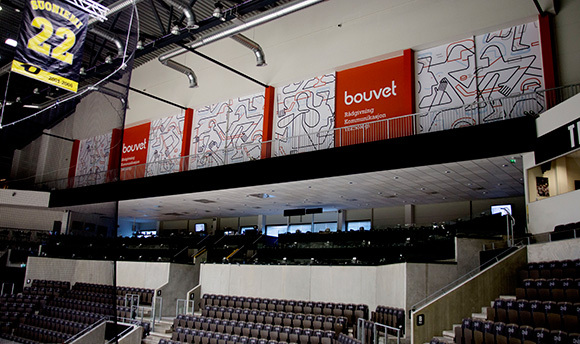 So when digital technology and communication brand Bouvet wanted to share their lasting relationship with Nordic ice hockey team the Stavanger-Oilers, Jonathan’s illustrative style surfaced as a winning match. Hoping to aid positive vibes within the DNB-Arena and business rooms, Bouvet chose Jonathan’s work to bring a ‘smile to the mind’ after it was presented by design agency Montaag in collaboration with Machas. 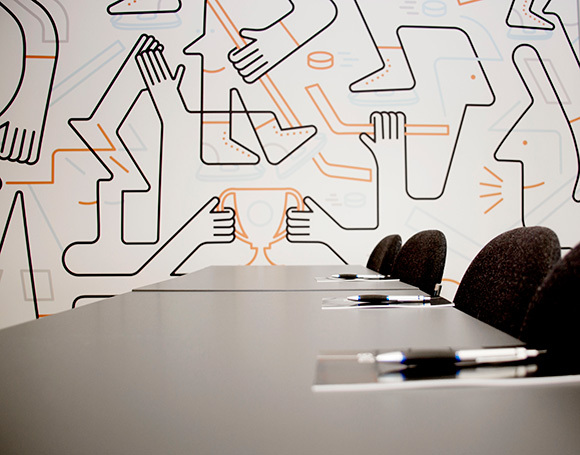 The Machas team managed the communication concept working with Jonathan to create two large scale wall drawings. The end result? Imagine watching a game of ice hockey with your eyes slightly ajar. What would you see? Perhaps quick movements, curvilinear stretched forms and dashes of bold colour. You may sense the elation, excitement and cheering in the arena around you. Now imagine this abstracted vision and passionate spirit distilled into intertwining lines and you have Jonathan’s impactive designs. Lively kinetic transitions see Jonathan’s playful spacial layering as audience and athletes connect. Now to bring this collaborative sense of fun into the workplace. Fingers flex and brains get switched on as workers wire up to exchange ideas in Jonathan’s interconnecting grid of people, technology and communication. 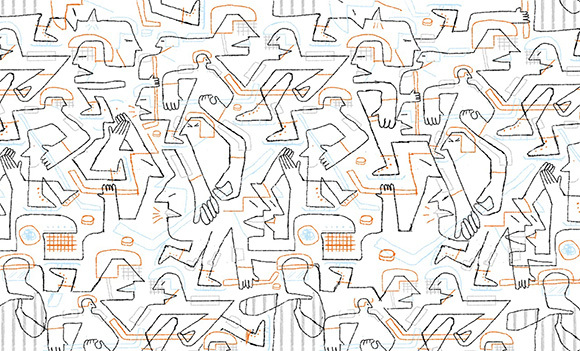 Clever details in the simplified compositions mean there’s always something new for eyes. “We knew that collaborating with Jonathan would create work of impact. Again he surprised us and did work that we never could have imagined, brilliant work” exclaims Montaag designer and partner Øyvind Kristian Tendenes. 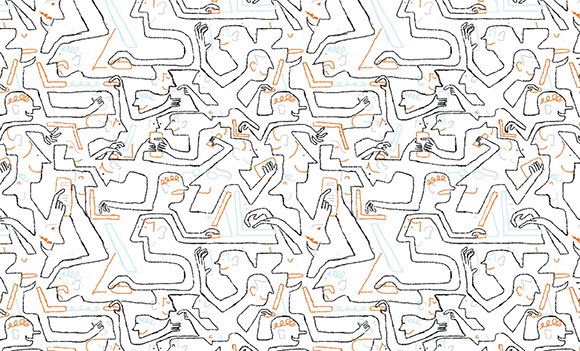 “Calugi’s ability to communicate and illustrate ‘a day at work’ and ‘a hockey game’ in a style that gives you a ‘smile in the mind’ is something completely new in the arena and has been a massive success for the client”. 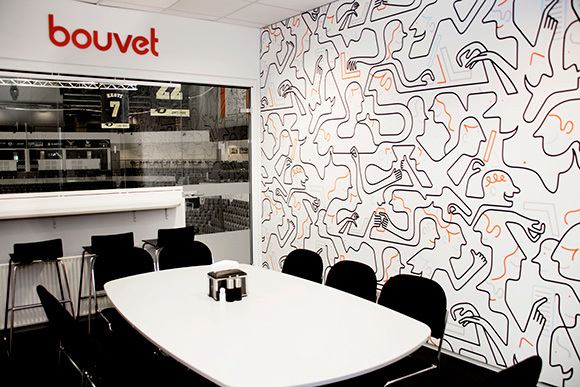 Discussing the project with the client, Øyvind noted that Bouvet employees embraced Jonathan’swork, as they connect and identify with his illustrations. 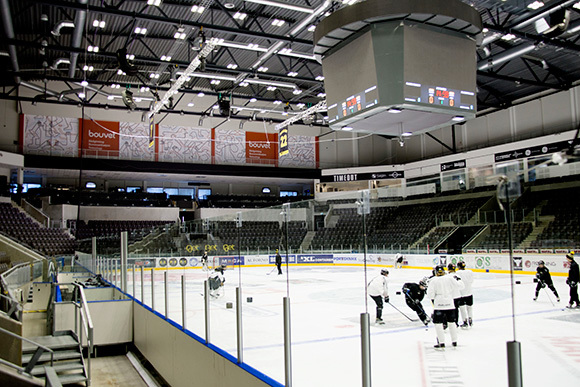 In the words of Øyvind, “the people working at DNB-Arena and the players of the Stavanger-Oilers really enjoy the hockey illustration and say that they ‘see new images all the times’, ‘it has captured hockey in a new way’ and ‘gives energy and really fits the arena with beautiful lines’”. In fact the designs were so successful that new merchandise featuring the illustrations are set to be created. With Jonathan’s lively images everyone can take away a piece of the action.